IK Multimedia is slowly expanding the threshold in portable DJing. 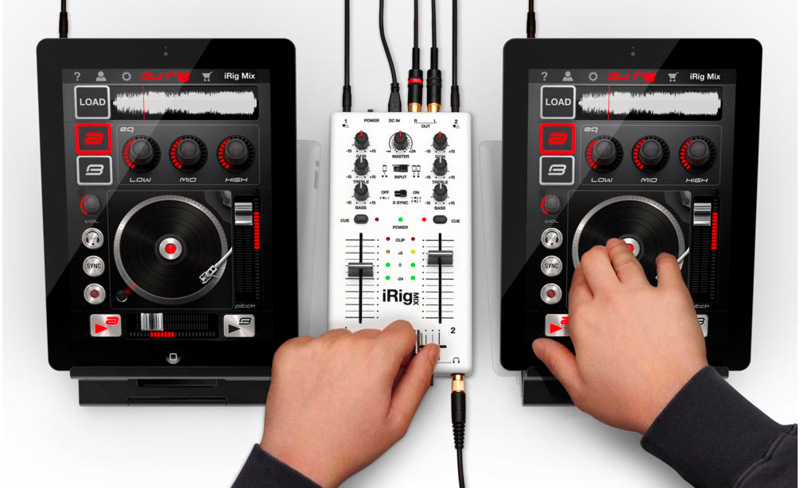 They have just released a pocket sized mixer capable of turning 2 Apple devices into mix decks used with an app called DJ Rig. The little piece of hardware known as the iRig Mixer ($99) features 2 stereo inputs with dedicated 3 band eqs and also features individual LED channel strips. The unit pumps out a unbalanced signal via rca cables to any amp or recording device. Do not expect awesome quality- please. The only major drawback I see to this is that I know of no one that will be willing to shell out the extra dough for another iPad, but one can have an iPhone or iPad on one side and an iPad on the other. It seams a little mismatched and may look frightening, but you will be able to look and act like a DJ, but like all the other mini gadgets featured on this blog, don’t expect people to take you seriously as a DJ.